On March 11 this year the S&P 500 index moved above 1,550. The index remained above 1,550 for most of March. This breakout is very important because it is a move above the long term double top pattern seen on a monthly chart of the index. The 1,550 resistance level is near the peak high of the S&P index in October 2007. It was also near the peak high in March 2000. This suggests 1,550 is a very significant resistance level. Traders watch carefully for the development of any chart pattern which suggests a rapid retreat from 1,550. Rapid retreats happened in 2000 and 2007. There is a danger that the S&P index will temporarily move above 1,550 and then develop a retreat. 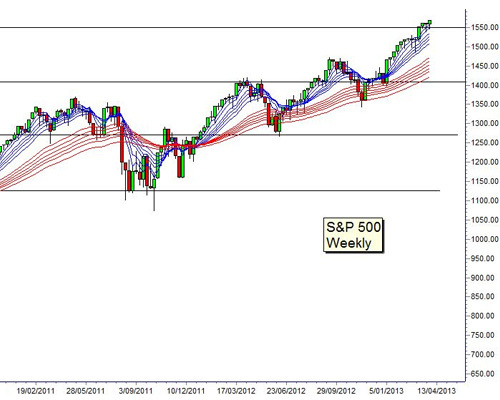 However the weekly and the daily chart of the S&P Index do not show any trend reversal patterns. This is a bullish environment that suggests the S&P uptrend is strong. The uptrend behavior also does not include any chart patterns which help to set upside targets. Analysis of the long term pattern of support and resistance shows the S&P index moves in wide trading bands. Each of these bands is around 140 index points wide. The recent rally is a rebound rally from a support/resistance level at 1,410. The width of the trading bands provides the next upside target for this uptrend. It is near 1,550 and this is also the long term resistance level. The market has developed a small consolidation near 1,550. This is a very strong bullish feature. This consolidation may be followed by a rapid breakout above this resistance level and 1,550. This rally breakout would confirm a very strong uptrend. The upside target for this type of breakout is near 1,690. This target is calculated by projecting the width of the trading bands above 1,550. The strength of the uptrend is also shown by the Guppy Multiple Moving Average (GMMA)indicator. This indicator has two groups of averages. The long term group captures the thinking of investors. Wide separation shows strong investor support for the trend. The short term group shows the thinking of traders. For the past there months the index is clustered near the upper edge of the short term GMMA. This behavior is very bullish. This confirms the strong and stable uptrend starting in October 2012. The uptrend is well defined using the GMMA. The S&P shows rally and retreat behavior with the lower edge of the long term GMMA tested in June 2012 and again in November 2012. For each test of the lower edge of the long term GMMA investors have come into the market as buyers because they believe the S&P can go higher. This is a bullish result and confirms the strength of the uptrend. There is a high probability this uptrend will continue to 1,690. Investors will buy when the index retreats towards the lower edge of the short term GMMA.